What a month February was! I don’t know about you but here in Northern Virginia we saw snow, ice, and cold throughout much of the month, had beautiful weather last weekend, and now are bringing in March with even more snow, ice, and cold. I am more than ready for Spring to finally arrive! Last month I had three goals. How would I grade and comment my progress in reaching those goals? 1. Run, walk, and elliptical a total of at least 60 miles. 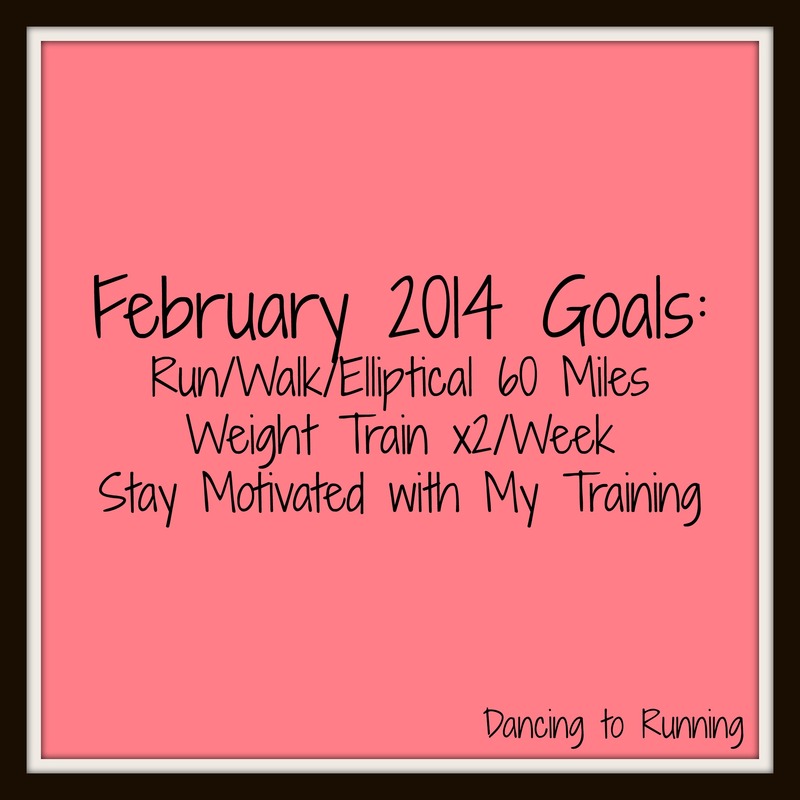 My mileage total for February was 59.26 miles, just 0.74 miles short of my goal. Had I not wound up in the hospital this past weekend I’m confident that I would have not only met but surpassed my goal so I’m trying to not beat myself up too much about not reaching this goal. 2. Weight train at least twice a week. I did not do as well in meeting this goal as I would have liked to. Although most weeks in February I did weight train at least twice, I didn’t spend as much time with the weights as I would have liked to. 3. Stay motivated with my training. Despite the rollercoaster weather we had in February, I remained focused on sticking to my training plan. Often times, training became my escape from the rest of the world. I was discharged from the hospital on Saturday with strict orders for rest, relaxation, and destressing. I don’t feel comfortable continuing to focus on running Rock ‘n’ Roll USA on March 15th until the doctor clears me to do so. Fortunately, after running the Disney World Half Marathon, I only took one week off from running, and have been running consistently since then. Preston is confident that this bump in the road won’t prevent me from being prepared from a physical standpoint for the race, but should I have to walk it if I do complete it, the course requires that I complete the race in under four hours, which is just over an 18 minute/mile pace. If I have to walk it, I’m confident I can walk it in the required pace. 2. Start doing yoga twice a week. As part of my efforts to start relaxing and destressing, I plan to start doing yoga twice a week. Fortunately, this is something I can easily do at home in our living room. 3. Focus on me time. Outside of training, most of my focus last month centered around work. This past weekend was a clear wake up call and I cannot continue to let life focus around my job. Although my job does demand that I plan and grade outside of my contract hours, its clear that I need to do a better job balancing my work and personal lives. 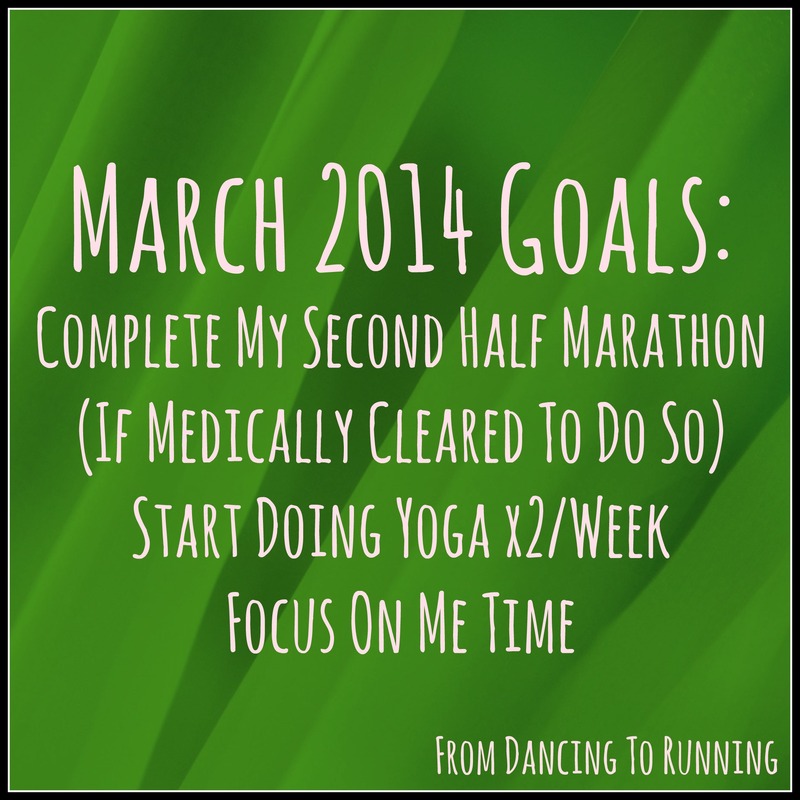 QOTD: What are your goals for March? I am hopeful that march brings us much better weather and I am also hopeful that I can get rid of the horrible knee pain i’ve had! I hope that you are medically cleared to run your race and I am confident that you will be able to finish in less than 4 hours even if you have to walk or walk/run/walk! I think we’ve put up with enough winter weather and am also hoping for much better weather. Hopefully your knee pain will go away soon! Wow, you have motivated me to set some goals. I am waffling over here AGAIN LOL. I am ready for spring though. OK, off for a run! Thanks for the extra motivation. Great job with your goals last month! You’ll do great in March too! Just listen to the doctor concerning your half. I know you will be able to walk it in that pace! Great goals, good luck with your 2nd half!!! I don’t have any major goals, but I am working on coming back from injury, so my goal for March is no set backs and to continue building on where I am at now. Best wishes for your recovery! Wishing you a speedy recovery! I’m hoping to see you at RnR, and that you get the OK from the doctor. Whether you walk or run, no matter what, you’re a rockstar! Thanks Jennifer! I appreciate the encouragement. I’ll be there regardless since my husband is also running the half. If anything, I’ll be there supporting him and everybody else running.